This Virginia DMV permit practice test, with multiple choice questions, is intended to help you prepare for the Virginia written knowledge test that is required before you can get your driver’s license. Passing the Virginia DMV permit test is as easy as 1 2 3 using our online interactive driving practice tests with high-quality images. Study for this driver’s license practice test is completely free. These free tests will help you be better prepared for your Virginia signs test and for the practical application of driving. Practicing and studying are the keys to passing the Virginia permit test. Take our 8 free practice tests and to learn how to get a driver’s license. Pass the first time by taking our free VA permit test. We offer the practice tests in both English and Spanish. This free Virginia DMV exam for learner drivers is similar to the real 2019 permit test. Over 200 practice Q&As from official driver’s handbook. Prepare for your permit test with our practice driving test. Gain access to 100s of practice questions and pass your permit test the first time! Free online written driving test for Virginia. Online permit test software for learner’s permit driver knowledge test. 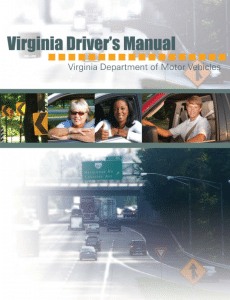 Virginia DMV Practice Test: Are You Ready for the Real Test? 1. Do you know what a speed limit sign means? Does it mean you have to go that speed limit, can’t go over that speed limit, or can’t go under that speed limit? 2. Do you know what a yellow sign with arrows and 13′ means? Does it mean drive 13 feet ahead, or you have gone 13 feet? 3. Do you know what a red triangle sign means? 4. Do you know when pedestrians have the right of way? Can a pedestrian cross the street anywhere and you have to stop? Or does a pedestrian have to use a crosswalk? 5. Do you know that funeral processionals and military convoys have the right of way in Virginia? 6. Do you know when it is legal to make a U-turn? 7. Do you know if you should use high beam headlights in rain or fog? 8. Do you know when you might lose your driver’s license? Do you know the penalty for driving under the influence? Do you know the penalty for driving while texting? Those are some of the questions you need to know to pass the test. We know some of that might be common knowledge, but not all of that is common knowledge. You might have also heard some wrong information and we want you to have the right information. So, we have created a Virginia DMV practice test to help you so you are ready for the real test. When you are ready to study and practice, contact us and we will help you get started.